DETROIT, Mich.-Newly hired assistant coach Lacema Womack continued to make strides in recruiting for the first-year track & field programs at Marygrove College. 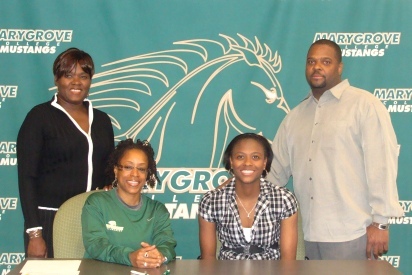 Recently, Clintondale High School product Crystal Macon signed a letter of intent to run for the Mustangs next season. Macon heads to Marygrove after an extensive high school career in basketball, volleyball and track. The stellar student-athlete committed four years to all three of the sports for the Dragons of Clintondale High. Showcasing musical talents, Macon participated in the school’s marching and jazz bands for two years. There was no denying she was at her best when it came to track. In 2007, Macon’s 4×200 relay team paced their way to an All-County 2nd Team selection. The 4×200 relay team came back for another year of success in 2008. This time, the speedy Dragons earned All-County 1st Team honors. Her junior season (2009) ended with All-County honors after 4×400 relay excellence and an individual best 48.9 in the 300 hurdles. Coach Womack on Macon: It has to be exciting for Crystal to be the first to sign with our women’s program. I am confident Crystal will prepare herself well for the collegiate level of competition. I am excited to coach Crystal and the rest of the team next year.